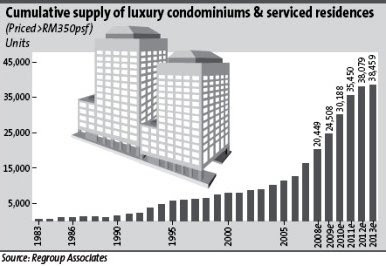 Office space, condos -what’s in for 2009? This is my inaugural contribution to this series for StarBiz and since we are at the end of the year, I offer some predictions for 2009. I specifically want to discuss the fate of the market for high-end condominiums and office space in Kuala Lumpur. All such predictions naturally hinge on a guess when the world’s leading economies will start to heal, and most of them have just gone into recession. Personally, I’ve never experienced a downturn in the market which went away in a year. If in doubt, I turn to the words of George Soros, who reckons it’s all going to be very bad. Those of us who took Soros seriously (I did) sold all their shares in 2007 (well, I was going to, honestly, but you know, things didn’t seem all that bad and there was always a chance that the crisis would blow over). America’s nemesis arrived after nine years of boom conditions when property prices and credit rose at a far greater rate than real incomes. Britain, most of Europe and Australia witnessed similar but more restrained booms. But sadly bubbles are ephemeral things and even champagne goes flat after a while. Fortunately for us, we had only enjoyed two years of real estate euphoria before the westerly wind blew in. Our markets were only just beginning to pick up. Had this financial plague reached us in say, 2011 or 2012 then we could well have been caught with our pants down as we were in 1997/98. In this respect, if we were going to suffer a global financial crisis, it came at an opportune time for Malaysia. Right now, we are fundamentally strong and what has only gone up a little bit will only suffer a limited decline. Nevertheless we are in for a tough year or longer. There are some highly geared developers who may have to struggle for survival. There is a growing crisis of confidence and we are peering into a dark pit of irrational pessimism. Deals are falling over as buyers walk away for fear of a severe market correction. The condominium market at the top end has been the most speculative of all markets over the past three years. Projects such as Troika and One KL which launched at a breathtaking RM1,000 per sq ft in 2005 rose in value to RM2,000 or more. The opportunity to own property close to KLCC has attracted a large community of foreign buyers for whom Malaysia has successfully created a very investor friendly environment. Sadly, many of these buyers are feeling the squeeze in their own countries and some are in a hurry to cash out. Those who bought early can afford to sell at RM1,000 per sq ft or less and so, we may see this secondary market leading values down in this sector. Sentiment is not helped by the number of new properties coming up. Currently, Kuala Lumpur has some 19,170 luxury condos and serviced apartments (with a value of RM350 per sq ft or more.) New projects under construction or approved could potentially add another 19,299 units. Even without a global financial crisis, some indigestion was looking inevitable before the market regained equilibrium. By contrast, the office space market enjoys a totally different set of dynamics. Rentals, yields and capital values are well established. There is a history of supply and absorption so well documented that it enables regression analysis. Demand for office space has a set of underlying fundamentals that can be tied back to economic growth and the maturity of the economy. Best of all, there are no twitchy secondary players prone to panic and flight. As recently as the second quarter of this year, office rentals were moving up to a realistic level of RM6 to RM8 per sq ft per month after nearly a decade of stagnation. Capital values had breached RM1,000 per sq ft and were cruising towards a peak which might have been RM1,500 per sq ft. Yields were down to 5% or 6% in anticipation of this growth. 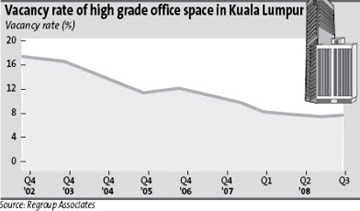 Despite the fact that KL currently has a shortage of ready office space, any growth in value next year is now unlikely. It is not that we are heading for an oversupply; it is only that tenants are going to “wait and see” before they consider upgrading or expanding. 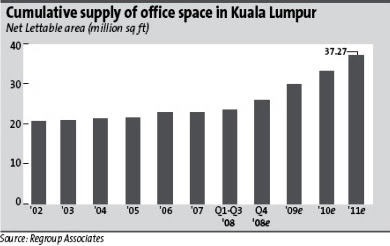 Perversely, with construction costs falling, now is a good time to start an office development in KL. The key word of course, is confidence. One has to have faith in the future. We can only hope that the banks will hold strong in their support of the property industry so that predictions of doom do not become self-fulfilling. Chris Boyd is executive chairman of Regroup Associates Sdn Bhd property consultants. He is a long-time registered valuer in Malaysia. Boyd feels strongly about the need for heritage conservation in Malaysia and is an active member of Badan Warisan. He keeps meaning to go to the gym but actually prefers cross-country running. TOKYO overtook Shanghai as the best Asian city to buy real estate as investors seek less risky investment for 2009, a survey by the Urban Land Institute and PricewaterhouseCoopers LLP showed. The Japanese capital has the best prospects and lowest risk among the 20 locations covered by the Emerging Trends survey. Singapore is in second place and Hong Kong is third, according to the ULI, a Washington-based research firm, and PricewaterhouseCoopers, a New York-based accounting firm. DUBAI: Dubai-based developer Meraas said it will review a recently launched US$95 billion (US$1 = RM3.64) property project, as more developers reassess and scale back work due to the global financial crisis. The government-owned developer said it was reviewing the phasing and rollout of its Jumeirah Gardens project which was launched at a Dubai property exhibition in October. There would be more clarity and details on the project's masterplan and the product rollout by the beginning of 2009, the statement said.